About Bauporte Doors UK - Barbour Product Search. Bauporte Doors UK Ltd. design, manufacture, deliver and install and boundary breaking innovation in automatic door systems. The company deliver bespoke grand entrances to London and beyond which incorporate automatic revolving, sliding and swing doors. The company's bespoke outlook to design ensures that their products are always individual whilst the designers work with their clients and architects to create a unique solution, which matches and goes beyond the needs of a building. 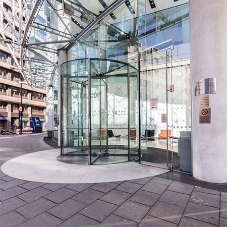 The company was the first to bring full-glass revolving doors and has installed the tallest revolving door in the world to market, and will further demonstrate cross-border innovation in the future. Bauporte offer ongoing maintenance for your entrances for an annual fee which keeps the warranty and guarantee rolling year on year, therefore lifetime door costs can be realized. BS EN 16005 Safety in use. Power operated pedestrian doorsets. Requirements and test methods.